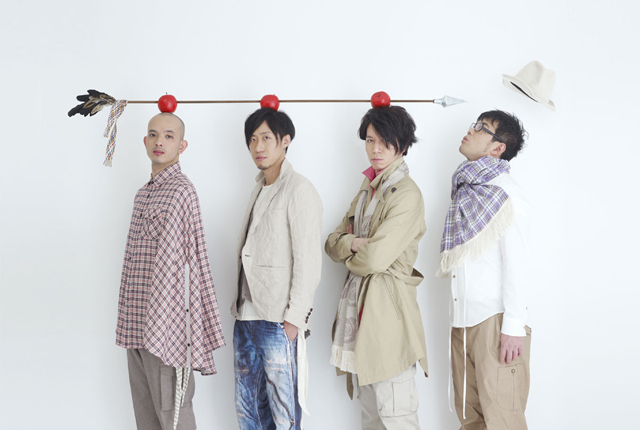 The band was formed in the hometown of Nagoya in 1999 by high school schoolmates. Released 3 Indies albums, which tread their way to a major debut with the single, “Night Call” in 2006. The band released the album “ARROW HELLO WONDERFUL WORLD”, an amalgam of their career from their Indies days and appeared in various music festivals and club events. The band attracted many fans, the majority of which being rock fans. In June 2007, released the party tune “Rock ‘n Roll Fanfare”, which featured a horn section. They further heightened their popularity by implementing flavors of dance music into their music and became popularized as “the rock band that makes you dance and cry”. In May 2008, original member Koji Ukai (Dr.) returned to the band, and once again, the band returned to its original quintet format. In February 2009, released the album “Alloy”, but in October, Iwahara Shunji (Gt.) left the band. Since then, the band has become a quartet of Ryuji Sakai (Vo. ), Takayuki Yamauchi (Gt. ), Masahide “Candy” Sakai (B. ), and Ukai.